It’s easier than you might think to learn how to download YouTube videos, and we’re going to take you through it, whether you want to store a music video or a NASA archive. It is generally legal to share and embed YouTube videos on the internet, but downloading them for your own offline use isn’t always permitted. Downloading videos is a violation of the YouTube Terms of Service, unless YouTube has explicitly given permission to download the video in question. It’s also important to note that some of the many YouTube download sites out there use unconventional money-making practices like cryptomining. While we do our best to recommend services that don’t use such tactics (and regularly updated our suggestions) if you find your system running hotter or harder than usual, make sure you don’t hang around on those sites too long. If you’d rather do without the hassle of downloading a particular application to download your favorite YouTube video, you can always use an online tool. Although there are a lot of web-based download platforms for YouTube, Online video downloader is our current favorite. It’s clean and fast and won’t have you clicking through pages which spawn popups or other intrusive ads. It’s great for converting YouTube videos to MP3 too. Step 1: Find the YouTube video you want to download and copy its URL from the address bar at the top of your browser window. Step 2: Go to the Online Video Downloader home page. Step 3: Paste it into the bar that reads “Search or enter YouTube link,” and hit the Enter key on your keyboard. Step 4: Wait a few seconds for your options to appear and then choose a file format that you want to download the video in. When ready, click the red download icon to the right of your chosen format. 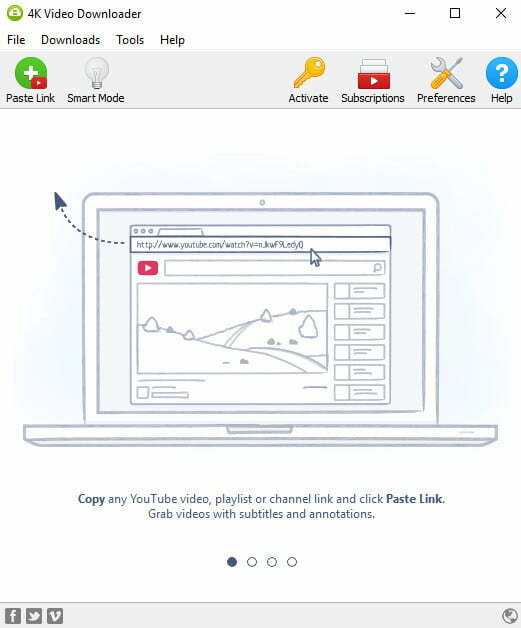 If you’re the kind of person who likes to have a dedicated piece of software for specific functions, there is a tool for downloading YouTube videos too. Although there are a number of alternatives out there, our favorite is the 4K Video Downloader. If you don’t have a 4K display, don’t be put off by the name, this is one of the most versatile download tools out there. The free version of this software has the ability to download individual videos at customizable qualities all the way up to 4K, has support for 3D and 360-degree videos, can download subtitles and is even able to do so via embedded links. Although there is a paid for version with a price tag of $20, that only enhances existing offerings rather than hiding the best ones behind a paywall. For your money, you can download larger playlists and use the subscription system to have it automatically download videos for you as and when they are uploaded. Step 1: Download the 4K Video Downloader from the official site and after installing, open it. Step 2: Navigate to your chosen YouTube video in your favorite browser (these are ours) and copy the URL from the address bar. In the 4K Video Downloader window, press the “Paste Link” button in the top left-hand corner. Step 3: Once it has finished checking the video, you will be given a number of options for video quality, format and conversions. You can also adjust the download location of the video. Note: The video the software grabs will be based on your IP address, not the URL you input, so VPN users, you may need to change your location to download the right version. Step 4: Click the download button. You’ll then be shown a progress page that details download size, download speed and estimated time remaining. You can pause and cancel the download at any time. Once you have the hang of it, the 4K Video Downloader can be configured to download videos automatically or with a single click using the “Subscriptions” and “Smart Mode” respectively. Don’t want to use 4K Video Downloader to convert your videos? There are a number of free alternatives. As one of the best media players out there, it’s perhaps no surprise that VLC can also help download YouTube videos too. It’s not as straightforward as other methods, but it still allows you to bypass ad-riddled websites and other third-party software that you might otherwise seek out. The method differs slightly between operating systems, but it’s not terribly confusing. Keep in mind that there are downsides to using VLC, however. You can’t convert the video to another format, or choose which resolution you prefer. But the software still gives you access to your videos faster than other tools, mostly because it downloads directly from Google’s servers. Step 1: Navigate to the YouTube video you’d like to download in your browser, and copy the URL. Then, launch VLC as you would normally, and click “Media” in the menu bar, followed by “Open Network Stream.” If you’re on a Mac, you’ll want to click “File,” then “Open Network.” Once done, paste your YouTube URL in the box housed within the Network tab, and click “Play.” Your video will automatically start playing in VLC. Step 2: If you’re using Windows, select “Tools” in the toolbar at the top and select “Codec Information” from the resulting drop-down menu. If you’re on a Mac, select “Window” and click “Media Information” in the drop-down menu. This will bring up a screen with various information about the video, but we’re only interested in the “Location” bar at the bottom. This will showcase the exact URL for your video, directly from Google’s servers. Go ahead and copy the link and paste it in the address bar of your browser. Step 3: The video will then play within your browser. Right-click the video, click “Save As,” or “Save Video As…,” and select a save location for the video in the window that appears. Then all you have to do is wait for the download to complete. That’s it! The video is now on your hard drive.